For direct keyboard access to the develop sliders (Exposure, Clarity, etc...) please read the separate guide. Note that Keyboard Tamer needs to know where Lightroom is located. If it can't find it in the normal locations it'll ask you to locate it before you can continue. The panel is divided into a number of tabs - one for each module and one called "Application Wide". In the latter you will find the shortcuts which are global across the application and which cannot be redefined on a per module basis. The tabs for each module contain the shortcuts that are specific to that module. 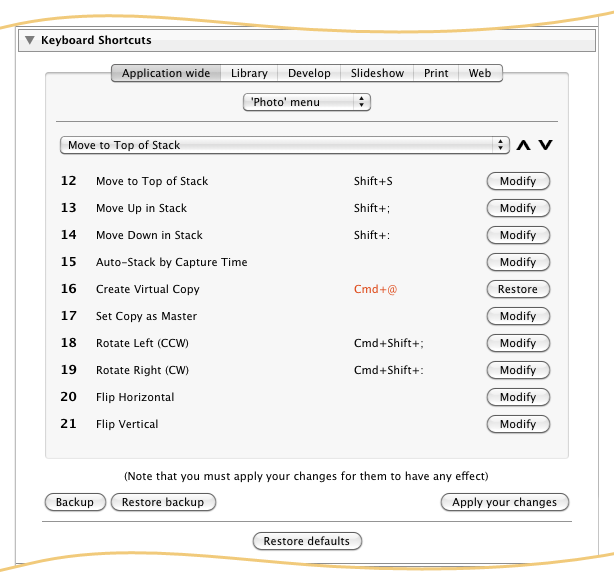 Features that are in two different modules could conceivably have the same keyboard shortcut. In each tab the shortcuts are divided up in to the menus in which they are found - choose the menu using the pull-down menu provided to access the shortcuts available. Once you have redefined your shortcuts you must apply them. If you do not then your changes will be lost when you close the plugin manager. Note that you must also restart Lightroom in order for your changes to take effect. Updates to Lightroom will probably remove your shortcuts so it's highly recommended that you backup your shortcuts (press the "Backup") button. This will allow you to save your personalised changes to a file so that you can restore them later. You can also send your backup file to other users who may wish to use your setup (they just need to "Restore" it). Keyboard Tamer works but adding the shortcuts to a file within Lighroom itself. The original file is not destroyed or overwritten, it is moved elsewhere and will be restored if you press the "Restore defaults" button.